Who can be from a place where virtually everyone –or at least everyone’s parents or grandparents– come from somewhere else? Who are “we”, in such a context? And, what resources can such “we” claim rights over? Over two years, from 2016 to 2018, I explored these questions in a peripheral neighbourhood in the city of Barcelona. The area, which was traditionally subjected to territorial stigma, was built in its current shape by internal migrants coming to the city from other parts of Spain in the second half of the twentieth century. More recently, at the turn of the millennium, people coming from abroad moved in to this part of the city. In such a context, how do the more established groups differentiated themselves from the more recently arrived? The research identified the boundary-work carried out by the more estabished group and how it is substantivized thanks to the Barcelona-wide “civic ideology”. This way the project showed how concrete public policies and the rhetoric used to justify them serves as a resource for the articulation of social boundaries at the micro level. By focusing on the discursive construction of we and them between internal and international migrants, the research contributes to the denaturalisation of the sometimes problematic clear-cut categorization between internal and international migration as King and Skeldon did in their fantastic 2010 article Mind the gap! Integrating Approaches to Internal and International Migration, and which is one of the negative consequences of the well-spread methodological nationalism in Migration Research (Wimmer and Glick Schiller 2002). The article is coming soon in the prestigious journal Ethnic and Racial Studies! This entry was posted in Uncategorized on March 22, 2019 by Diana. ¿A qué huelen los otros? This entry was posted in Uncategorized on December 9, 2018 by Diana. Human mobility is a highly interdisciplinary and complex issue which has been approached from diverse national academic traditions and methodologies of investigation (DeTona et al 2010). Although the study of migration was initially dominated by empiricist-positivist approaches, there is by now a well-established tradition of qualitative studies (Iosifides and Sporton 2009). More recently, within the realm of feminist, critical and experimental scholarship, there has been an upsurge of new and creative methodological developments. These include a diversity of participatory approaches, ranging from social action-research, to research involving different types of participation (Arnstein 1969). This is particularly relevant at a time when not only scholars but also different institutions are currently promoting participation and societal involvement in research. This work has questioned well-established separations such as those between researcher and research participants, or between academia, activism and social work (Pereira et al. 2016). So far, though, these studies have not received systematized attention and to a large extend remain as scattered small case studies. Trying to redress this situation, this special issue aims to showcase overall connections and developments by providing an updated account of participatory approaches in migration studies, and to provide a fora to reflect on the possibilities, limits and challenges of making use of participatory methods in migration research. Given that participatory projects often imply the use of artistic or non-textual elements, they compel us to consider the nature of scientific research, and how to accommodate other forms of knowledge production and dissemination. These include but are not limited to, considerations about how to account for the inclusion of the body and the sensorium into this type of research. We are particularly interested in works that reflect on the possible existence of a gendered aspect of participatory methodologies. Some elements found in many participatory projects (e.g. nurturing in research, carrying projects in personal time, non-conventional publication venues) may even contribute to the gender productivity gap in Academia and therefore work against already disadvantaged scholars (peripheral, female or early career researchers). In particular, we welcome considerations about if, and how, these methodologies may link, contribute and interpellate the postulates of the Slow Academia and feminist approaches to academic life and purpose. Participatory research is an umbrella term under which sits a wide-ranging variety of projects, therefore the need of studies on definitions and core features of participatory research and methodologies. These may take the form of review articles that report on the appearance and development of participatory projects in different disciplines (as long as they have any relation with migration), or works that attempt to advance conceptual clarity by mapping participatory projects. We are expressly interested in the power dynamics between different parties taking part in participatory projects, and in particular on the power dynamics that lead to define who is to participate and what participation actually means. Finally, we welcome accounts of the limiting and enabling forces around the possibility and sustainability of these type projects over time. Reflections on how to come around the issue of problematic access to funding particularly when involving open research agendas are needed. We foresee that comparative studies or projects carried out in areas or scholarly traditions other than Anglo-Saxon or European ones, may provide insights on the structural features of academic research that hinder or bloom the possibility of carrying out participatory projects. Ideally, we envisage articles that present specific participatory projects from any discipline and covering any geographical scope and migrant group, but which go beyond the case-study at hand and provide broader theoretical reflections. Authors will be informed about the outcome of the pre-selection process by 15th January 2018. Full drafts of 3,500-4,000 words excluding references, tables and graphs will need to be submitted by 1st April 2019. Please note that full articles will have to undergo double blind peer review in order to be accepted into the final publication. This entry was posted in Uncategorized on November 13, 2018 by Diana. This entry was posted in Uncategorized on November 4, 2018 by Diana. Presentation at the Panel on Two-step approaches to understanding migration at the IMISCOE 2018 Conference (2-4 July). Although immobility has gained status as a proper research object, its image as a default situation still prevails in some of the migration literature, where stayers are still labelled as ‘left behind’ (Jónsson, 2011). However, similarly to the migrant category which subsumes together different realities, the immobile label is imposed on situations that present internal disparity. The idea of staying put as the result of taking no action is severely compromised in the analysis of the ethnographic data collected in the small Mexican village of Zacualpan. In the socio-geographical context of this village, crossed and built upon a myriad of present and past mobilities, the research explores how villagers willing to remain, manage to stay put in a context of high physical mobility. Data show how, similarly to migration, staying put is often part of complex life strategies which involve changing mobility-immobility articulations. The ethnographic material supports the explanatory power of breaking down the aspiration phase from the realisation one to understand the (mis)matching between desires and capacities for situations of permanence (Carling, 2002). Three broad types of stayers are identified: desired, acquiescent (Schewel 2015), and involuntary (Carling 2002) stayers. The research particularly explores how villagers willing to remain, have managed to stay put in a context of high physical mobility, and how staying villagers perceive the desirability and feasibility of staying put compared with that of migrating. 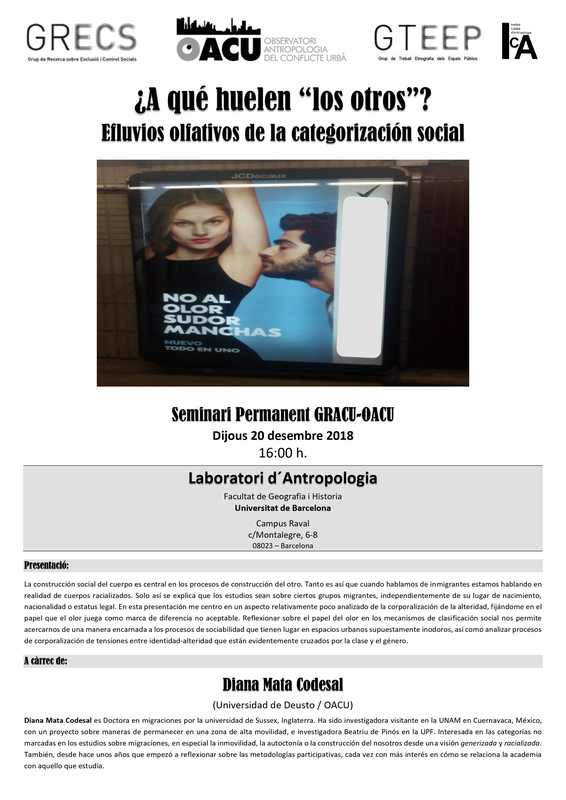 This entry was posted in Barcelona, Conference and tagged desired immobility, IMISCOE on July 4, 2018 by Diana. Me decía un amigo que había vivido en Suiza en los tiempos de la emigración española a Europa allá por los años sesenta, que entonces eran los españoles los que olían mal. Obligados a vivir hacinados en condiciones precarias, el gueto español desprendía olor a chorizo y cebolla. Décadas después estas representaciones parecían no haber existido y la convivencia con esos migrantes del sur de Europa en los paises europes como Suiza o Francia se presentaba como libre de tensiones. En 1991, el entonces alcalde de París y futuro presidente de la república francesa Jacques Chirac hizo un polémico discurso en el que, además de la ya clásica referencia acusadora a la supuesta buena vida que se ve que da vivir de las ayudas sociales, mencionaba el ruido y el olor [le bruit et l’odeur] que salían de las casas de algunos inmigrantes en Francia como un motivo que justificaba las quejas racistas de algunos trabajadores franceses (blancos). El discurso no tiene desperdido. Entre otras cosas decía Chirac que “Puede ser verdad que no hay más extranjeros que antes de la guerra, pero no son del mismo tipo. Es cierto que había españoles, polacos y portugueses trabajando aquí, pero eso generaba menos problemas que tener musulmanes o negros”. El mal olor que se atribuía a les espagnoles desaparece de los registros sustituído ahora por el de los inmigrantes árabes y africanos. De hecho, en cada momento, los cuerpos explotados en trabajos físicamente demandantes, huelen siempre a sudor, indendientemente de lo limpios que en realidad estén, porque el olor es un marcador simbólico: oler es estar sucio, tanto física como moralmente. This entry was posted in Uncategorized on June 28, 2018 by Diana.